Business ethics have become an important topic globally for both policy-makers and businesses. 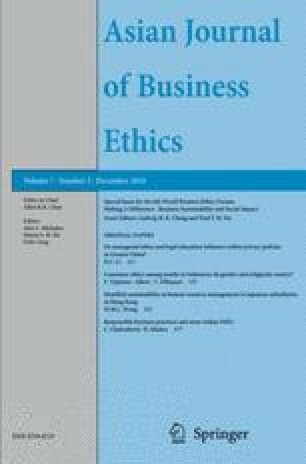 This paper first discusses the conceptual framework for business ethics followed by ethical management (EM) and corporate social responsibility (CSR) as well as relevant theories. Within this conceptual framework, Korea is used as a country context as to the development of EM and CSR. An important example of an ethical scandal is the major steel manufacturer, POSCO as it was held up as an exemplar and role model of ethical management. However, in 2015, it faced allegations that the engineering and construction overseas unit chief of its Vietnamese subsidiary created a slush fund by overstating payments to Vietnamese contractors. This conceptual paper discusses the factors that created this situation referring to the theory of connection. It locates the case in the EM and CSR literature and analyses what went wrong and what the parent company could have done to prevent this from happening. Anti-corruption and Civil Rights Commission. (2014). Act on anti-corruption and the establishment and operation of the anti-corruption and civil rights commission. Resource document. Seoul: Anti-corruption and Civil Rights Commission http://www.moleg.go.kr/english/korLawEng?pstSeq=47442andpageIndex=93. Accessed 1 March 2017. Chan, L. M., Othman, J., & Jones, R. (2011). The conceptual model of personal moral philosophy (PMP) and ethical decision making (EDM). Journal of Management Research, 3(2). https://doi.org/10.5296/jmr.v3i2.752. Cho, J. Y. (2015). Overseas scandal: POSCO E & C involved in slush fund scandal. Seoul: Business Korea Resource document. Korea Times. http://www.businesskorea.co.kr/english/news/industry/9293-overseas-scandal-posco-ec-involved-slush-fund-scandal. Accessed 1 March 2017. Chung, A. Y. (2015). Ex-POSCO chairman indicted for corruption. Resource document. Seoul: The Korea Times http://koreatimes.co.kr/www/news/nation/2015/11/116_190728.html. Accessed 1 March 2017. Ha, P. (2015). Slush funds and bribery scandals overshadow Vietnam’s highway procurement. Resource document. Vietnamnet.vn. http://english.vietnamnet.vn/fms/business/127377/slush-funds-and-bribery-scandals-overshadow-vietnam-s-highway-procurement.html. Accessed 1 March 2017. Jung, M. (2015). POSCO subcontractors raided in slush fund investigation. Resource document. Seoul: The Korea Times http://www.koreatimes.co.kr/www/news/nation/2015/03/116_175394.html. Accessed 1 March 2017. Kim, Y. E. (2015b). Prosecution to seek warrant for POSCO E & C’s ex-Vietnam head. Resource document. Seoul: Korea Herald http://www.koreaherald.com/view.php?ud=20150320000799. Accessed 1 March 2017. Kim Y. J. (2015c). Scandal-hit POSCO forms panel to restore tainted corporate image. Resource document. Yonhap. Retrieved http://english.yonhapnews.co.kr/business/2015/05/14/0501000000AEN20150514012200320.html. Accessed 1 March 2017. Lee, H. S. (2015). POSCO to enhance ethical management. Resource document. Korea Times. http://www.koreatimes.co.kr/www/news/biz/2016/07/123_182807.html. Accessed 1 March 2017. Matthews, C., & Gaudel, S. (2015). The 5 biggest corporate scandals for 2015. Resource document. New York City: Fortune http://fortune.com/2015/12/27/biggest-corporate-scandals-2015/. Accessed 1 March 2017. McGregor, J. (2017). More CEOs are getting forced out for ethics violations. Resource document. The /Washington Post. https://www.washingtonpost.com/news/on-leadership/wp/2017/05/15/more-ceos-are-getting-forced-out-for-ethics-violations/?utm_term=.d99777624299. Accessed 1 March 2017. Noh, H. W. (2015). Corruption investigation at POSCO widening to probe of illegal political funding. Resource document. Hankokreh. http://english.hani.co.kr/arti/english_edition/e_national/708501.html. Accessed 1 March 2017. Shen, L. (2017). The biggest business scandals of 2017. Resource document. Forbes. http://fortune.com/2017/12/31/biggest-corporate-scandals-misconduct-2017-pr/. Accessed 1 March 2017. Son-Van Khoa, Thai (2015). Vietnam responds to South Korea’s slush fund scandal, finds nothing amiss. Resource document. Thanh Nien News. http://www.thanhniennews.com/business/vietnam-responds-to-south-koreas-slush-fund-scandal-finds-nothing-amiss-40728.html. Accessed 1 March 2017. Statement on Park Geun-hye as South Korea’s newly elected president. (2012). Resource document. Seoul: Transparency International Korea https://www.transparency.org/. Accessed 1 March 2017. Transparency International (2017, 2014). Resource document. Berlin: Transparency International. https://www.transparency.org/country#KOR. Vietnam responds to RoK’s slush fund scandal (2017). Resource document. Voice of Vietnam. https://www.vietnambreakingnews.com/2017/01/vietnam-responds-to-roks-slush-fund-scandal/. Accessed 1 March 2017. Vietnam to inspect projects embroiled in South Korea’s slush fund scandal. (2015). Resource document. Thanh Nien News. http://www.thanhniennews.com/politics/vietnam-to-inspect-projects-embroiled-in-south-koreas-slush-fund-scandal-40946.html. Accessed 1 March 2017. What is ethical management? (2014). Resource document. Seoul: National Agricultural Cooperative Federation https://www.nonghyup.com/eng/Ethical/EthicalManagement/Definition.aspx. Accessed 1 March 2017.